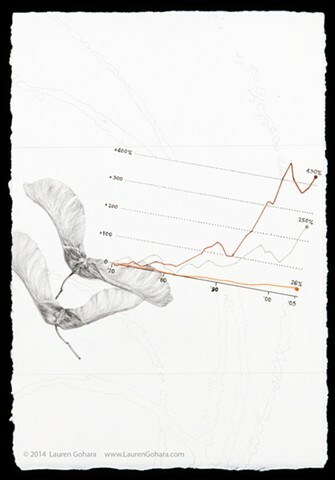 Renderings of two found maple seeds in graphite fly in at left, intersecting a thin line graph. In red, pale gray, and orange, the lines contrast the rise in median executive income since 1970 (up 430%) vs. the rise in corporate profits over the same period (up 250%), vs. the rise in average wage income (26%). Particle physics tracks drop through the background.